One of my favorite clients is the Morton Arboretum, who I've been shooting for for about the last ten years. One of the cool things about the Arboretum is the yearly installation exhibits they've been doing. I've shot Steel Roots (steel piping twisted into the shape of tree roots), Legos, metal frogs, even large scale origami art, but I think this year's takes the prize for the coolest. 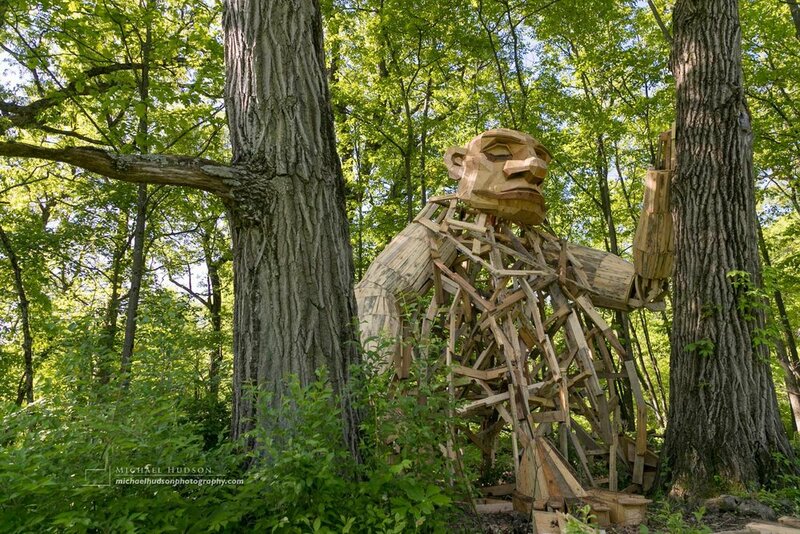 For the last couple months, artist Thomas Dambo from Denmark and his team have been constructing gigantic trolls from reclaimed wood, and placed them in fields, in the woods, overlooking the highway and elsewhere. I spent a couple hours photographing the trolls under construction in late May. Now they're finished and I'm heading back this afternoon to photograph the 'official portraits' of the completed trolls, with people to show the scale of the giants. Should be fun. The trolls are on display for the next 2-5 years, depending on how long they last in the Chicago weather. If you're in the area, go see them; you won't be disappointed.